Granola update | Fork off, heart disease! 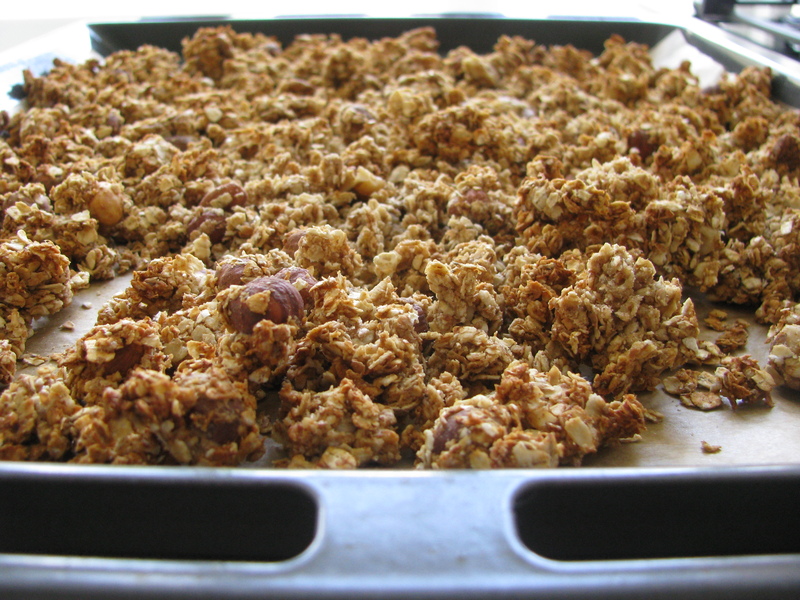 In my first post, I told you how I tried Mark Bittman´s healthy granola recipe. I am relatively happy with it but I found that sometimes it is a bit too dry and not sweet enough. I keep tweaking with the recipe every week and this weekend, I came up with my best version ever! It all started with these fresh dates that were lying around in the fridge for what seemed like eons. Then I got a flash of inspiration – what if I would make a slurry out of those dates and add them to the granola mix? That would solve both the dryness and sweetness issue. Once again, fruit slurry managed to transform an OK recipe into something worth writing home about! So in went the 250g of dates (about 10, with pit removed) in the blender. I covered them with just enough water (until the 500 ml mark on my blender) and made a thick slurry. Instead of using 1/2 C agave nectar, I was able to reduce that to 1/4 C and added it to the slurry (you can, of course, adjust it as you see fit). In the oven it went for 45 min at 125°C. Then remove from the oven, flip, and bake for another 45 min. The result was soooo good. Crunchy and just sweet enough.